A group of Trade Union and Labour party members from Mansfield and Ashfield have written an open letter calling for a final say on Brexit. 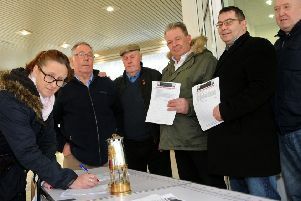 In their letter, Labour members Joan Taylor, from Selston, Peter Thom and Mark Brewin, from Mansfield, and Steve Law and Robinna Cámara, from Bolsover district, and trade union member Daniel Swarbrick, from Kirkby, said: “We are worried about the threat Brexit poses to workers’ rights. “EU laws safeguard our rights and they are developing new legislation to give protections to people working in the gig economy and on zero hours contracts. Brexit Britain would miss out on new rules forcing employers to give reasonable notice of shifts, limiting probationary periods to six months, giving you the right to take on a second job, and to receive a reply to requests for more secure hours. “The Government have said they will give Parliament a vote on whether to adopt new European rules. However, their track-record proves they cannot be trusted with key employment legislation. “It’s time the public has an opportunity to decide if losing the rights we have fought for is a price they want to pay for Brexit.